Activate Prime Membership in Jio to Extend the Validity of Reliance Jio. The most frequent questions search on google right now is that; how to extend the validity of Reliance Jio 4G? There are lots of unofficial apps that are telling you that'll activate or extend the validity of Jio. But that's the biggest lie ever heard on Google. It doesn't up to anyone, everything is just controlled by the servers. So, how could you think that the App will hack it and you can bypass the limits and use unlimited Jio 4g net or extend the validity? I warn all of you guys, who's searching that term. This app contain some scripts and some kind of code that will fetch all information from your smartphone and that information might be; contacts, messages, bank details, etc. It one kind of malicious app that will be used to play with your privacy. So, please friends do not download and install My Jio App from unofficial resources. How to Activate Prime Membership to Extend the Validity of Reliance Jio 4G? Jio is the world's no 1 telecom company that have more than 100 Million customers right now. It's the world record that they just moved to the top of the list within a Year. The reason behind of this is giving free unlimited 4g data, calls, and SMS for more than 6 months. Obviously, Jio broke up all records and telecom market by giving Jio Preview Offer, Jio Welcome offer and Now, Jio Happy New Year Offer. Now, we're going to move up on the solution. All the users who're using Jio from lasts 3 months are eligible to activate prime membership and extend the validity for 3 months but this time you'll not get that offer for free. You've got to pay some money to continue Jio Happy New Year offer. You've to become the Prime Member of Jio. To be the part of that, You'll have to pay Rs 99 only and that will be just to become the prime member of Jio. To continue free usage of data, unlimited calls and SMS you've to pay Rs 303 every month. It means, 1 GB of 4G Data, Free Unlimited Calls and SMS will be charged only Rs 10/day. This is still amazing offer from Reliance Jio. The more interesting news is that you'll be able to renew that offer for 1 Year completely. You can pay Rs 303 per month/year. It's the cheapest plan ever offered by Reliance Jio. On Airtel, Vodafone, and Idea, they will charge you the same offer at more than Rs 1000. I don't think, those telecom company will give you the same offer at this price range. 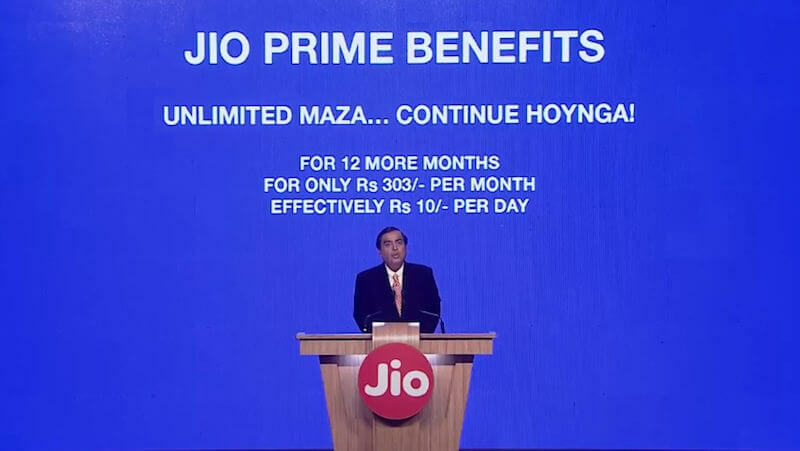 How to become the Jio's Prime Member? The Registrations will be started up from 1st March of 2017 till 31st march of 2017. In between, you can pay to activate and enjoy the Happy new year service for 1 year. please, note my words, the last date of Prime registration is 31st March 2017. After that, you'll not able to register for jio prime membership. Where I've to go to Activate Prime Membership in Reliance Jio? All you need to do that is to just open My Jio App, tap toggle icon on the top left side of the app, see the plan option on that menu. You will be able to see the Activation of Prime membership. Another step is to go to Jio's official website and log in to your account and activate this offer. The Last and easy step is to go on Offline Store of Jio whichever located in your area. They will do that in a chunk of minutes. Official Announcement of Jio Prime Membership By Mukesh Ambani! “Our 100 million initial consumers are Jio’s foundation. Today is the day for me to show my gratitude to you, the initial 100 million customers and assure you always continue to get extreme value with Jio,” announced by Mukesh Ambani. Jio will offer additional latest value plans for Jio Prime members as well, features of which are accessible on MyJio app and Jio.com. The full bouquet of Jio media services contains JioTV, JioCinema, JioMusic, JioMags, and JioXpressNews. “We are putting together a line up of deals and offers from Jio and its partners for Prime members,” Ambani said. You can Begin Jio Sim Prime Membership. So, these are the information that we've collected from our tech experts and some of them got it from the internet resources.